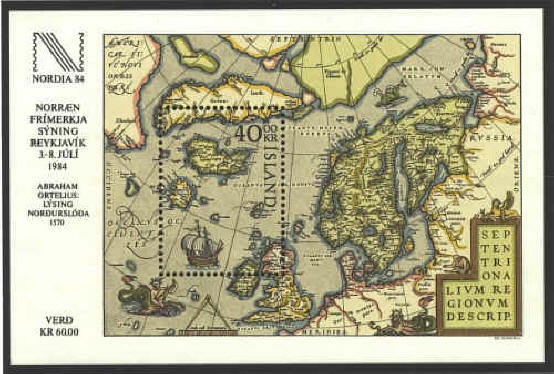 For the map of the northern regions, Septentrionalium Regionum Descriptio, published in Theatrum Orbis Terrarum by Abraham Ortelius 1570-1612, he drew heavily on the Carta Marina of Olaus Magnus, first published on wood blocks in 1537, with an engraved version in 1589. 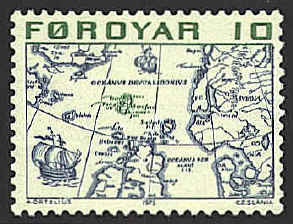 On the edge of the imaginary Polar continent a note says, "Pigmeys live here;" (perhaps Santa's elves?). 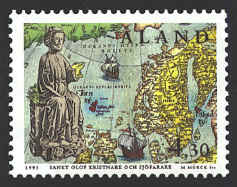 The stamps from Åland and Faroe, issued in 1995 depict a wooden statue of St. Olaf, King of Norway, with Ortelius’ map in the background. 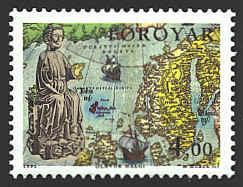 The statue is hollow and was originally placed in the Church of Sund on the island of Åland.